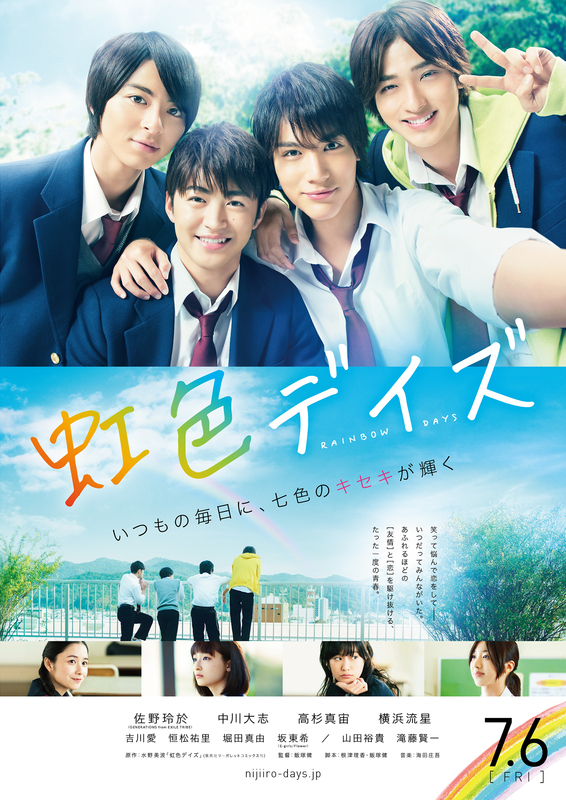 Natsuki Hashiba (Reo Sano), Tomoya Matsunaga (Taishi Nakagawa), Tsuyoshi Naoe (Mahiro Takasugi) and Keiichi Katakura (Ryusei Yokohama) are high school students. They are very close friends, even though they have different personalities and hobbies. Their days are spent happily and vibrantly. Natsuki Hashiba gets a crush on female high school student Anna Kobayakawa and their daily lives begin to change. Based on manga series "Nijiiro Deizu" by Minami Mizuno (first published February, 2012 in Japanese shojo manga magazine Bessatsu Margaret). Filming begins in the middle of October, 2017 and finishes November, 2017. Name May 20 2018 3:29 pm Handsome and talented bunch for the main cast! And Bando Nozomi of E-girls and Flower! I don't know the other girls yet, but good luck to them too! Erlyn Apr 05 2018 4:28 am I'm a fan of Ai Kayano but where is the character of Nozomi Matsunaga, sister of Tomoya and a loveteam of Keiichi. This is not a love triangle. Each of them have their own partner. Rumi Mar 11 2018 8:37 am TAISHI!!! AS!! MATSUN!!!! Omg the hype is real ??? L Mar 03 2018 8:34 pm Oof i can’t wait. I read the manga and watched the anime, this’ll be exciting. mel :3 Dec 21 2017 11:31 pm omg I can't wait ? anhang Oct 14 2017 8:29 pm now i wonder who'll be the leading girl, i hope aoi morikawa get cast! Deva Fassah Oct 10 2017 12:56 am It will be a great movie ?